Product #2399 | SKU BEVD400 | 0.0 (no ratings yet) Thanks for your rating! From elastic delay to vintage slap-back echo, the VINTAGE DELAY VD400 harnesses the authentic sounds of classic 1960s studio wizardry. 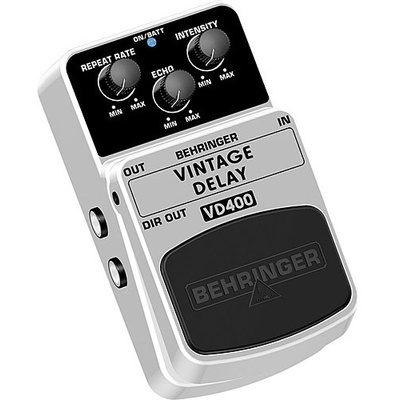 Though digital sound technology constantly evolves, nothing sounds quite like the “old-school” analog Bucket Brigade-style delay you get when you step on the VD400. With its dedicated REPEAT RATE, INTENSITY and ECHO dials, this amazing little stomp box evokes the spirits of some of rock and roll’s most legendary heroes, and provides up to 300 milliseconds of true analog delay. Every type of classic delay, from a deep-space whisper, to an interplanetary battle cry—is at your command. The bright blue LED tells you when the Vintage Delay is activated (and serves as a beacon for other time travelers), and the top-quality on/off switch maintains excellent signal integrity in bypass mode. You can power the VD400 with either a 9 V battery or our PSU-SB DC power supply (not included).